'Lupus' is a rheumatological condition affecting the immune system, and like many serious symptoms of the condition lupus skin rash is one of the most common, and a helpful aid in the initial diagnosis of the condition. Systemic Lupus - this is the more severe form of the auto-immune illness affecting the skin, joints and in serious cases vital organs of the body such as the heart and kidneys. Discoid Lupus - the less serious strain of the disease, commonly causing skin problems and the distinctly recognized lupus rash. There is also a form of lupus which is medication-induced. Certain medications to treat high blood pressure and/or heart problems, along with others which are taken to treat seizures are known to trigger the auto-immune condition. When diagnosis of lupus has not yet been made one of the presenting symptoms which commonly assists diagnosis is the presence of a rash prominent on the face. This rash is known as the 'Butterfly Rash' as it presents in the shape of a butterfly across the bridge of the nose and the cheeks. For some individuals this rash can be extremely feint and barely recognizable but it is the distinct shape and formation of the rash which is the determinant of the illness, as opposed to the severity. Discoid Lupus Rash - Also known as 'Chronic Cutaneous Lupus' the rash associated with discoid lupus tends to be prominent, thick and scaly in its nature. It can occur anywhere on the body however is commonly known to affect the face and scalp, and is known to be itchy. Due to the nature of it, after the discoid rash has healed it generally leaves scars which in those with darker complexions tends to result in discoloration where the rash was. When the rash affects the scalp it usually leaves behind areas of permanent hair loss due to damage to the scalp and associated hair follicles. 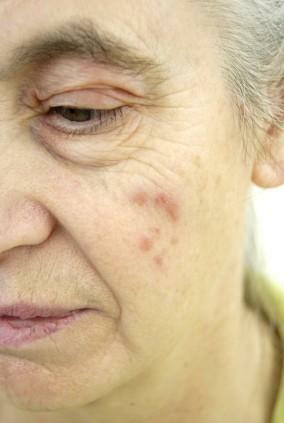 Acute Cutaneous Lupus Erythematosus - this is the type where the classic butterfly rash presents. Often exacerbated by contact with sunlight or artificial UV light. There is no scarring as a result of this rash. Subacute Cutaneous Lupus Erythematosus - this presents with a distinct rash particularly to areas exposed to the sun. The rash tends to be circular with scaly patches which do not scar. Bullous Lupus Erythematosus - the rash associated with this presents with fluid filled blisters affecting the skin which has again been exposed to sunlight. Neonatal Lupus - affecting the newborn the rash in neonates appears similarly to that of the subacute cutaneous rash. Mothers with or without lupus may have bear an infant with neonatal lupus. Topical treatments - usually consisting of creams and ointments, these treatments are commonly steroid-based ranging from the very mild to the very potent steroid component, depending on the severity of the rash. For those suffering from the skin problems associated with 'discoid lupus' the injection of steroid under the skin can provide longer lasting, more effective control of the symptoms. Oral treatments - common for use in most individuals with lupus treatment, anti-malarial tablets are a useful aid in controlling the prevalence of the skin rash. These medications need to be taken over a period of months before the positive effects are achieved. Steroid tablets or injections - these types of treatments are reserved for the individual who has not responded to the other less severe treatments noted above. Due to unpleasant side effects of steroids the decision to commence this treatment requires careful medical assessment and observation. As with other conditions of the human body skin rashes and other related conditions are a common symptom. When a rash first presents on the body it is unlikely that lupus is the first condition the sufferer would attribute the rash to, therefore it is essential to seek the advice of a doctor or pharmacists when any unusual rash appears on the body, no mater how mild or severe. The importance is not to 'self-diagnose' a skin condition without the backing of sufficient medical knowledge. Although there are many harmless skin rashes, there equally are some which are associated with serious medical conditions so it is best never to make assumption as to possible causes.